Our team is regularly making news or interesting announcements, see recent articles, publications, research, or announcements all summarized here. 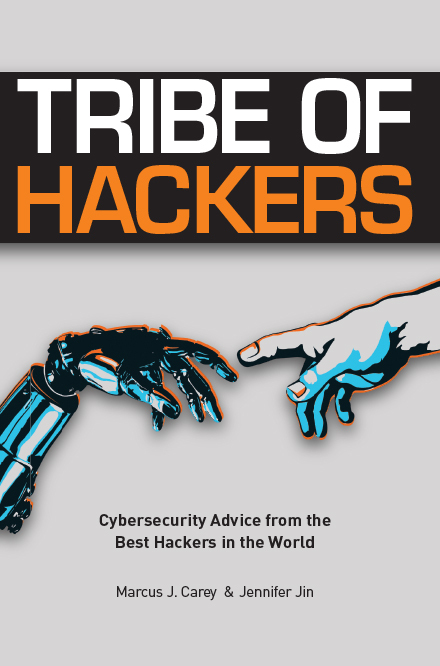 Stephen Ridley was included in the new book, Tribe of Hackers, published by Threatcare, which contains cybersecurity advice from the best hackers in the world. There are already hundreds of thousands of cybersecurity professionals and, according to some sources, there is a shortage of several more hundreds of thousands. Tribe of Hackers wants to change that. It was a pleasure to be on Risky Business, this time discussing the challenges of facing hardware supply chain security. Listen to the podcast here. 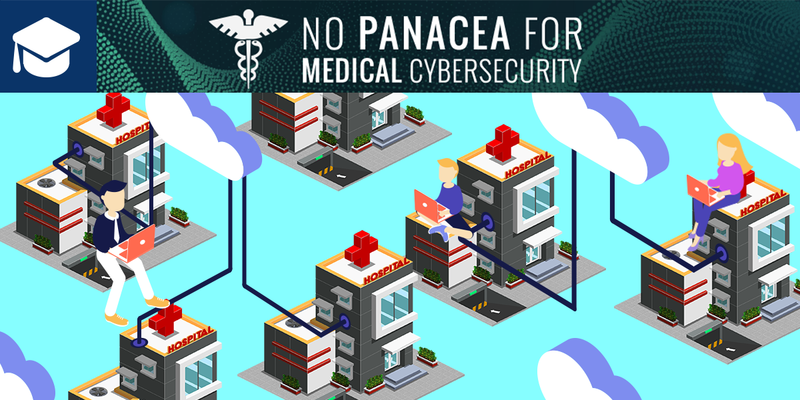 VP of Research M Carlton quoted on the threats to medical device security in The Parallax. Every device connected to a network is a potential weak point – even if the role that device plays seems minor under ordinary circumstances. 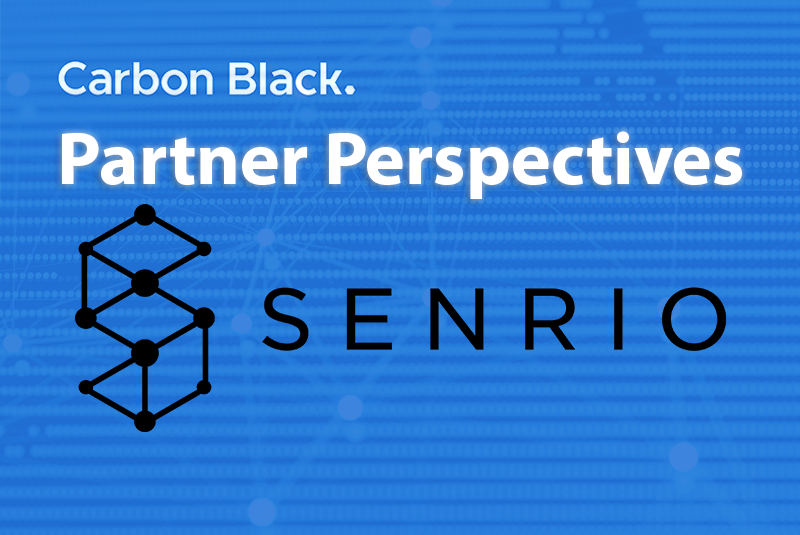 Together, Carbon Black and Senrio provide comprehensive awareness and visibility into all connected devices, helping to ensure that you know exactly what makes up your enterprise. 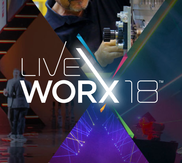 VP of R&D M. Carlton will be discussing lateral attacks between networked embedded devices using real-world examples in popular devices at the LiveWorx event in Boston. 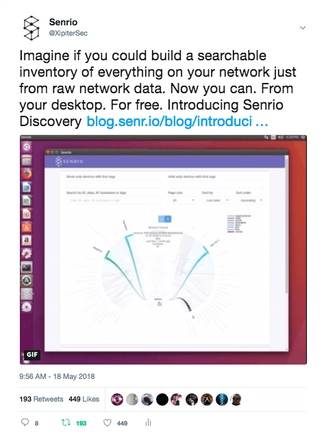 Today we announced “Discovery” a desktop app that uses a small piece of the Senrio Insight cloud to help firms build searchable inventories from raw network packet captures. The tool is also free to try! Read a full blogpost about it here, or jump directly to the product page (http://iot.security/senrio-discovery) to learn more and get started! Stephen Ridley talks about the abysmal state of IoT security, his recent exploitation of an IP camera and router to exfiltrate corporate data and his experience as a minority in the security industry. At the 2018 RSA Conference VP of Research M. Carlton and CTO Stephen Ridley demonstrated for the first time publicly an IoT hack that resulted in a breach of personally identifiable information. At the IoT Village our talk ”Lateral Attacks between Connected Devices in Action” showed how a relatively unskilled attacker could compromise enterprise security without ever triggering an alert from traditional end-point or network security protections. Senrio’s investment in IoT device research pays off yet again! Exclusive coverage in Wired details how an attacker with relatively low-level skills can infiltrate an organization and exfiltrate sensitive data through IoT devices only, never touching a traditional end-point. ​Read the full article at Wired. Quebec City, April 12, 2018 - (TSXV: HEO) - H2O Innovation Inc. (“H2O Innovation” or the “Corporation”) is proud to announce that it has partnered with Senrio, Inc. , provider of the leading IoT visibility and security solution, to provide users of our proprietary IntelogxTM system, performance monitoring software with a greater level of awareness and visibility into IoT device health and safety. In addition to the collection of operational data from multiple devices on water and wastewater plants, the integration of Senrio Insight with IntelogxTM will allow customers to rapidly respond when atypical patterns of behavior are detected or when unauthorized devices are discovered by Senrio’s self-learning technology. After being analyzed by Senrio’s predictive analytics engine and the world’s largest device intelligence data store, it will provide the operators continuous surveillance on its infrastructure and trigger alerts when abnormal behavior is detected. 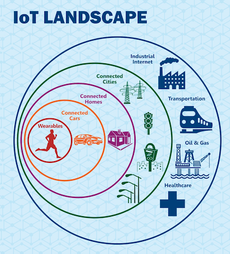 Senrio publishes a comprehensive free “IoT Security” Infographic to help individuals and businesses stay current on relevant news and data. Read the blogpost and download the infographic here. We announced today that in addition to existing integrations with Splunk, RSA, SEIMs, all major firewalls, and familiar dashboards, Senrio Insight users can access Senrio data directly from Slack! Read the blogpost to watch a video of it in action. 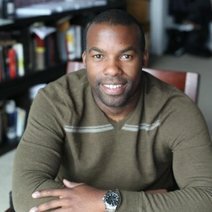 Senrio VP of Research (M. Carlton) will be keynoting Amazon’s private ZonCon on March 13, 2018 in Seattle, WA. CTO, Stephen Ridley will be in attendance also. 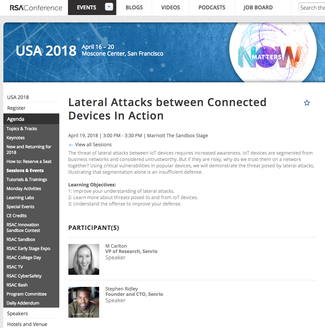 Our CTO and VP of Research will be speaking @RSAConference 2018 on “Lateral Attacks Between Connected Devices In Action” on 04/19/2018! Located at the Sandbox Stage in the Marriott Marquis. We are going to chain together several hacks to bounce between IoT devices and access sensitive employee personal data…WITHOUT touching a pc or server. This will be the first time an “IoT-only” compromise (with chained attacks on devices) will be demonstrated publicly. Our “IoT Hacking” BlackHat 2018 Training Sold Out! 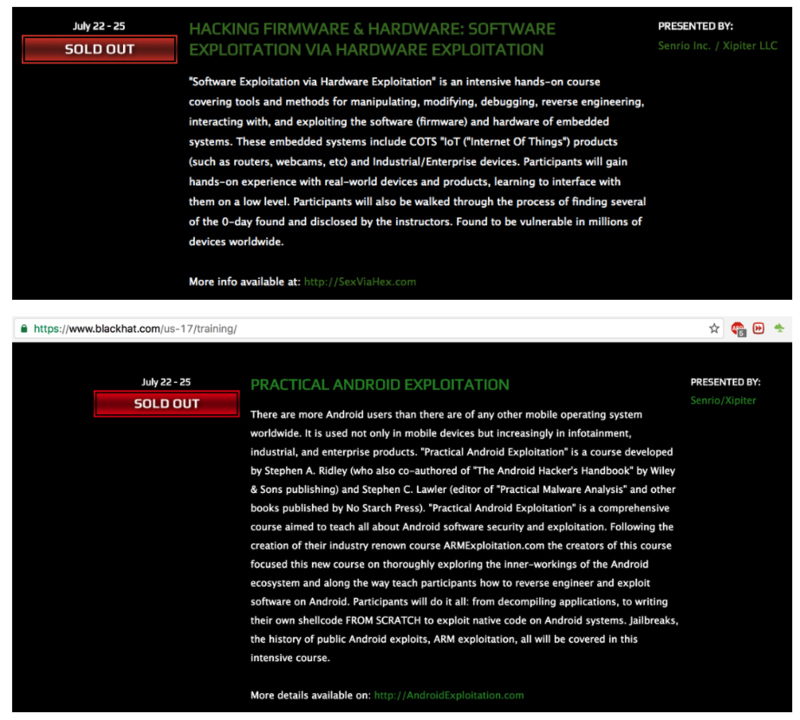 Our hardware/firmware/IoT hacking training is consistently one of a handful of trainings to sell out in the first few weeks at Black Hat for the 7th year in a row! Full text of the Press release is here. ​**This talk explores the lateral attacks between networked embedded devices using real-world examples in popular devices. We live in a world heavily reliant on the devices that power our homes, hospitals, and critical infrastructure. 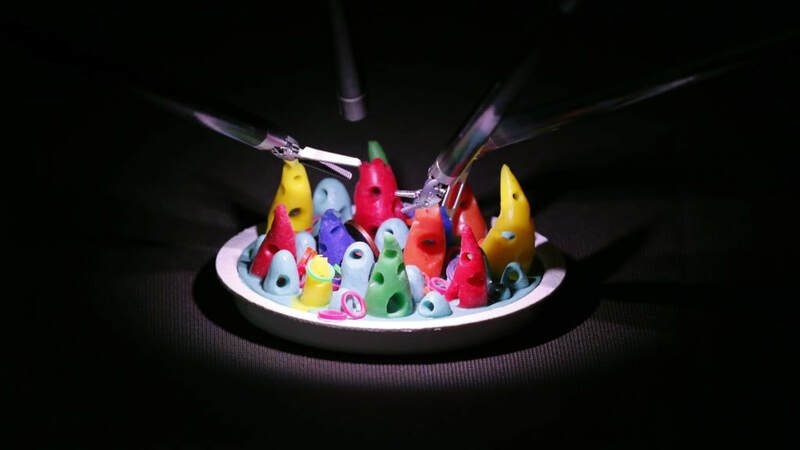 These devices are connected in ways we never imagined. We know that IoT is ubiquitous and often insecure, but we haven’t yet grasped the full scope of how connected we really are, and how vulnerable that makes us. By changing how we view these essential devices, we can secure the future of our infrastructure and hospitals. An exclusive Q&A with Stephen A. Ridley, CTO, and founder of Senrio on Decoding IoT Security at #nullconchat. 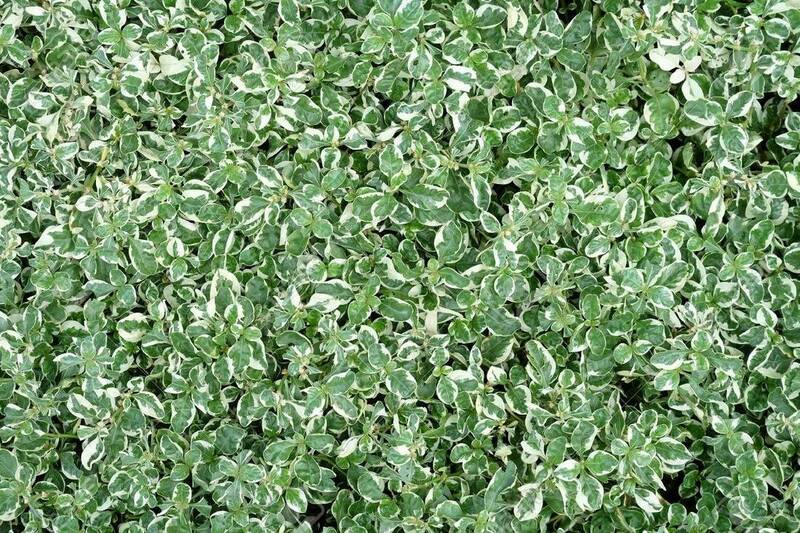 Earlier this year, the IoT-focused security firm Senrio discovered a hackable flaw called Devil’s Ivy, which has the potential to put thousands of different models of security cameras at risk. The vulnerability is found in a piece of open source code called gSOAP, created and maintained by a small company named Genivia. At least 30 companies use gSOAP in their IoT products. Our founder and CTO Stephen Ridley asks the question: Can We Make the IoT Safe for Water? Find out the answer by attending the American Water Summit in Austin Nov 29-30. Adobe CSO Brad Arkin moderates a neat series of interviews with industry leaders. 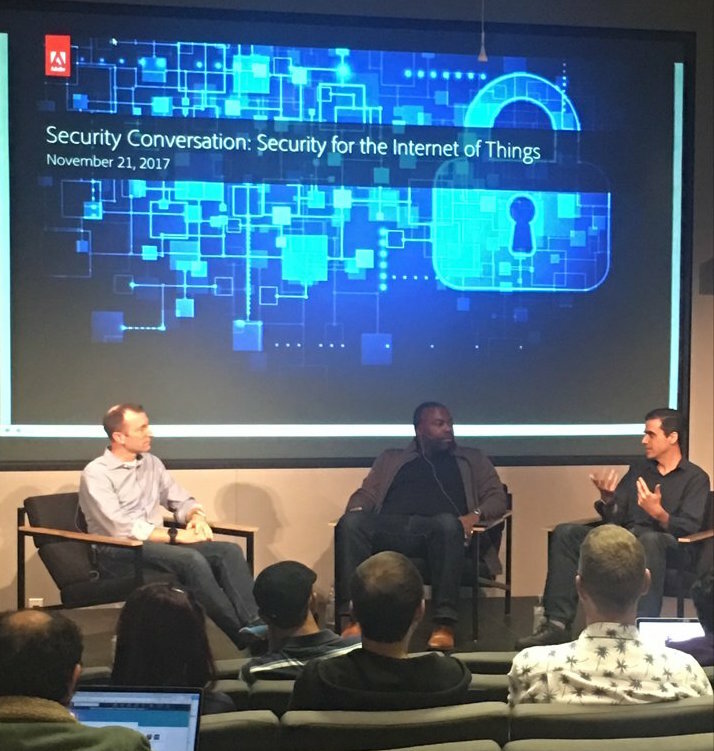 We were honored to have Mr. Arkin interview our CTO, Stephen Ridley about the security of devices of all kinds…and to discuss how the IoT security challenges (in particular) are merely a manifestation of traditional Application Security challenges. 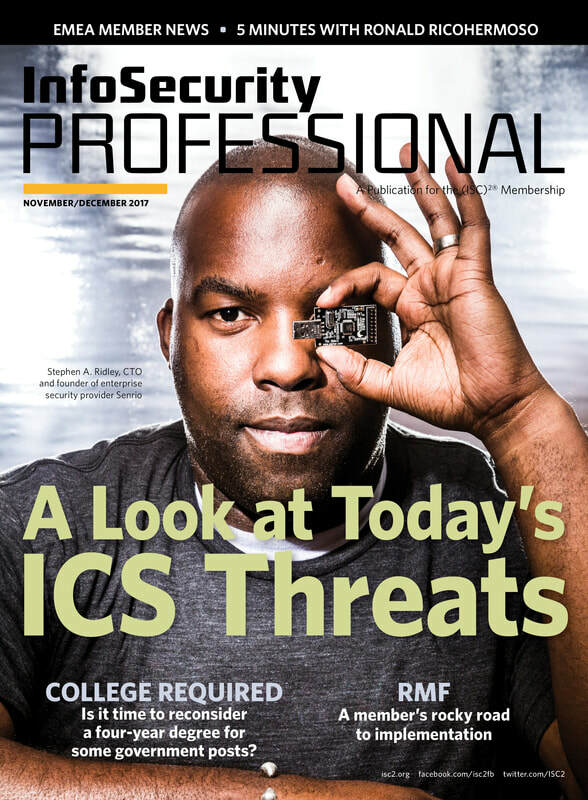 CTO Stephen Ridley graced the cover of this month’s ISC2 magazine and was interviewed about threats to the Internet of Things. 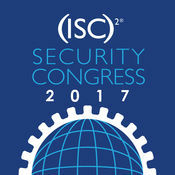 ISC2 is the organization responsible for cybersecurity industry standard certifications like the CISSP. ​Read the full article (account required). Stephen is one of the co-authors of the Android Hacker’s Handbook. In addition to leading class on a shortened version of our perennially popular hardware exploitation class, Stephen Ridley spoke about The Insecurity of the Internet of Things - highlighting our research on Devil’s Ivy - at the annual Industrial Control System Cybersecurity Conferencein Atlanta. 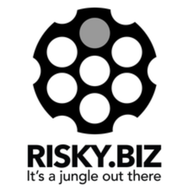 It was our pleasure and privilege to be on Risky Business again, this time talking about our discovery of a vulnerability in gSOAP - blog.senr.io/blog/devils-ivy-flaw-in-widely-used-third-party-code-impacts-millionsDevil’s Ivy - that showed how ‘vulnerability reuse’ is a problem for both the commodity IT and IoT domains. We have a Twitter Moment capturing some of the tweets during the event. But we also have some fantastic photos to share in a large gallery within the next few days. We’ll announce it via twitter here. “We basically have complete control of the camera as if it was our own computer,” said Stephen Ridley, founder of security startup Senrio in a phone call with Motherboard. Senrio Voted a “Must-See” Innovation at MD&M East! 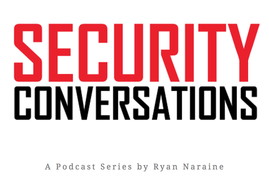 ​We were fortunate enough to talk with the venerable Infosec journalist Patrick Gray on his fantastic podcast “Risky Business”. Hear why we shifted from offensive IoT security research to product. This is really our first public share of how our stuff works! Senrio Inc listed in CyberSecurity Ventures’ “Companies to Watch in 2017” list. 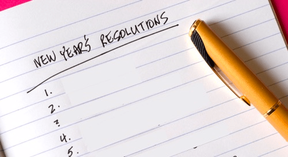 The list tracks companies from all over the world based on several criteria which you can read about on their site. On this Down the Security Rabbithole podcast we’re joined by Stephen A. Ridley & Jamison Utter for a discussion on the finer points of Internet of Things (IoT) security … or complete lack thereof. If you own gadgets that are ‘connected’ or you are ever around them (hint: you’re surrounded by things that pull IP addresses right now) then you need to listen to this podcast. Some great discussion in what was the very first podcast we recorded in 2017. The FTC has filed a lawsuit against D-Link for failing to protect its customers against ‘well known and easily preventable software security flaws’ in its routers and IoT cameras. ​How insecure are products like broadband routers and smart surveillance cameras? The Security Ledger sat down with three experts from the firm Senrio to discuss the matter. “DATA, DATA, DATA. Effective Information Security departments these days are less about cool tech for IR, detection, policy, and orchestration. We have a wealth of those for traditional endpoints/networks. What we now see is that Information Security (like the rest of technology) is that we need to be better about storing and utilizing data (and in an actionable time-frame). The largest transportation networks own no cars. The largest search engines and social media sites generate no content. It’s all about data management. Security is now no different. Solutions that don’t speak to how data is stored, searched, parsed, and effectively plugged into your existing architecture need to be ignored. 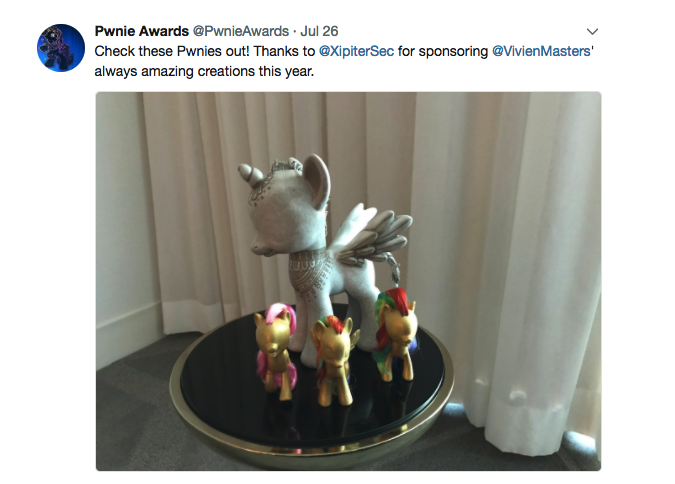 Security products need to provide operational value now. We’ve evolved past the ‘how’ and now need to focus on the ‘why.’ Security solutions have the burden of bringing more to the enterprise than just security. ​On this week’s show we’re taking a look at the Great DDoSSening of 2016! Yep, we’ll be having a look at the attacks against Dyn, but perhaps more importantly we’ll be asking the question: With a zillion perma-owned things out there able to launch some pretty serious DDoS attacks: What now? 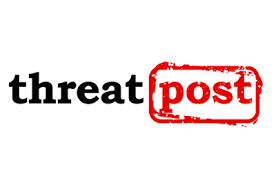 In-brief: A common, China-based supplier of management software is the common thread that ties together the myriad digital video recorders, IP-based cameras and other devices that make up the Mirai botnet, according to analysis by the firm Flashpoint. Device makers and vendors gather to discuss the future of IoT. 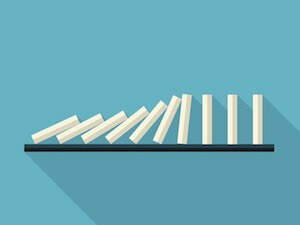 As technology becomes more entwined with the world will security failures have a graver impact? DDoS attacks are nothing new, nor is it new for Krebs on Security to be a target, but the recent attack that forced the site off the network is reported to have been powered entirely by internet of things devices. Former U.S. Defense offensive security researcher and founder of IoT cybersecurity company, Senrio, Stephen A. Ridley said that’s no surprise. “This should serve as a serious wake up call that IoT has a serious security problem,” Ridley said. ​Senrio ‎CTO and founder Stephen Ridley told SCMagazine.com that researchers are more able to discover “the hallmark of a specific attack” following the release of code containing exploits affecting Cisco products. 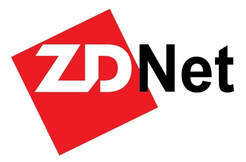 Companies have likely been observing the behavior of their network traffic, he said. He told SCMagazine.com that he suspects new vulnerabilities “could have been discovered” through an examination of network traffic in the wild. The “1-day” tactic used to be primarily an offensive tool, he said, referring to the process of reverse engineering a vulnerability from a manufacture’s patch. ”1-days” are highly valuable, Ridley noted, especially concerning networking equipment and embedded devices due to difficulties applying patches to embedded systems. In this week’s feature interview we chat with Stephen Ridley about all things IoT. Stephen is a researcher turned entrepreneur and he’ll be along to talk about the platform consolidation we’re going to see when it comes to “things”. Once that settles, he argues, we’ll get a better idea of the security risks we should really, actually be worried about. In this week’s sponsor interview we’re chatting with Simon Galbally at Senetas. Listen now. 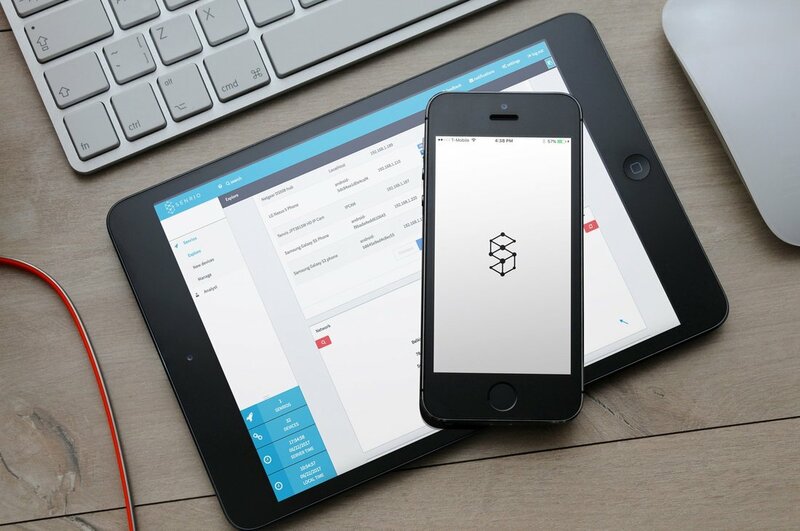 Not long ago, we sat down with Portland startup founder Stephen Ridley, the founder of Senrio. 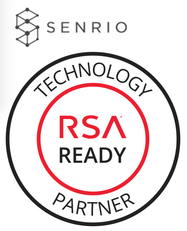 Senrio is an entirely new approach to data security, a Software as a Service product that easily scales to protect all kinds of companies, from small businesses to major medical, critical infrastructure, and financial institutions. For this edition of the Making Oregon podcast we bring you one interview divided into two episodes. In the first half, we ask Stephen to tell us about his path from teenage hacker to working for the Department of Defense, Wall Street banks and social media companies. He’ll tell us how his love of research eventually lead him to become an entrepreneur—two pursuits that require very different skill sets. He’ll describe Senrio, how it works, and what makes it different from other security applications. We’ll learn how it addresses the vulnerabilities found in embedded systems. And yes, we’ll explain how ubiquitous embedded systems are—and here’s a hint—they exist in your cell phone. In our second episode, we back track for a couple minutes and make sure everyone is on the same page with understanding how Senrio works. Then we dive into a discussion about best practices for protecting data, especially if you are a small business. Stephen will also talk about the vulnerabilities he and his developers find in consumer electronics and how Senrio can play a role in providing solutions. Plus, we’ll get his take on data privacy, metadata and what social media giants like Facebook are doing with the information users supply, whether they know it or not. Finally, we’ll ask whether data privacy really exists in today’s world and how Stephen balances his awareness of security issues with his own personal practices in daily life. Shodan has turned up half a million D-Link devices exposed to the internet, and subject to easy hijacking using zero-day vulnerabilities. The stack overflow vulnerabilities affect more than 120 D-Link products, from Wi-Fi cameras to routers and modems, and allow remote attackers to completely hijack the administer account of the devices to install backdoors and intercept traffic. It takes only a single line of code to hijack over 400,000 vulnerable D-Link devices. 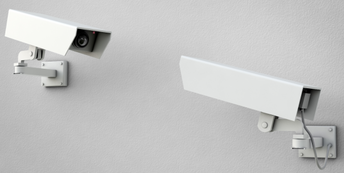 The stack overflow issue gives attackers the opportunity to overwrite administrator passwords in home Wi-Fi cameras, placing users at risk of being spied upon. The remote execution flaw not only allows an attacker to set their own custom password to access devices but also add new users with admin access to the interface, download malicious firmware or reconfigure products how they please. Senrio, a private security firm, announced that it had discovered a remote code execution vulnerability in D-Link’s latest firmware version that could affect five cameras in the D-Link product line, including the DCS-930L Network Cloud Camera. Portland-based Internet of Things cybersecurity provider Senrio has officially emerged from stealth to launch a platform which provides defence in healthcare, critical infrastructure, and retail environments. A new start-up, Senrio, unveiled its sensor this week: a new security monitoring tool that can identify and monitor embedded devices connected to your network and spot anomalous or malicious behavior. An unpatched vulnerability in a popular Wi-Fi camera from D-Link allows hackers to reset the device’s password and gain remote access to its video feed. Today, Senrio, an Internet of Things (IoT) cybersecurity solution, emerges from stealth mode with the launch of an IoT network cybersecurity platform that provides visibility and defense for networked embedded devices (NEDs) used in healthcare, critical infrastructure, retail and corporate environments. This vulnerability can be exploited with a single command which contains custom assembly code and a string crafted to exercise the overflow. 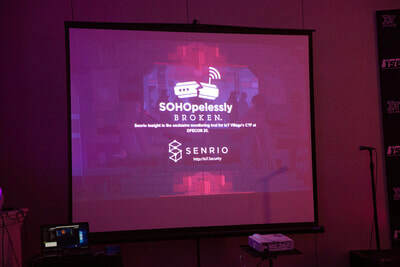 Senrio’s algorithms scan the devices on a company’s network for software vulnerabilities and configuration problems that might be exploited by hackers. Meanwhile, a passive monitoring component records the behavior patterns of each device to understand what constitutes normal usage. One hidden feature in the device’s firmware lets anyone remotely reset the NetBooter device to its factory default configuration – an action that would sever it from the network. Another allows anyone to modify network and system settings. A third, hidden function could be used to extract data (like a recently entered password) stored in the device’s memory, according to Stephen Ridley, a principal at Senrio.